I recently ran across an organization called the American Tradition Institute. The Sourcewatch piece on them is quite disturbing. 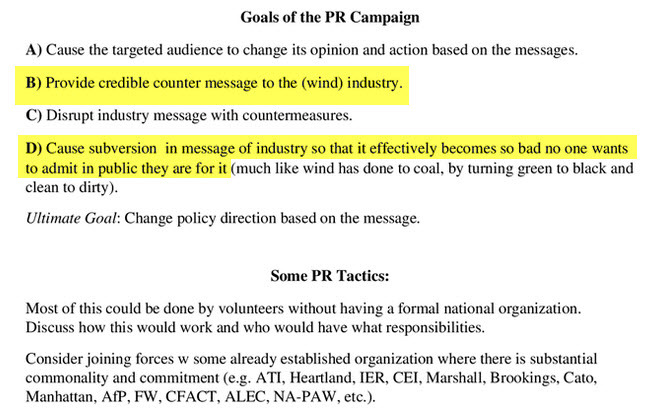 Particularly the confidential memo produced by one of their “fellows” that explicitly seeks to “subvert” the wind energy industry. See Excerpt below. Climate change denial folks are now beginning to cover their tracks as this piece discusses. In particular an organization called Donors Trust is creating “dark money” that is difficult to trace to the donors. It is clear that there is a large systematic effort moving to undermine growth in renewables. This is not surprising given the enormous size of the fossil fuel industry. The impact of these groups cannot be underestimated. In Massachusetts, the first two wind turbines of the megawatt scale were installed in the town of Hull MA. Complaints were minimal. The larger of these turbines was sited within 500 feet of a residence. Since that time there has emerged a blueprint for systematic destruction of wind turbine projects as has been going on in Kingston MA. A few angry residents have tried to portray it as being plopped into a quiet green leafy suburban neighborhood. In fact the turbine is sited on a landfill in a commercially zoned area with heavy retail such as shopping centers and car dealerships. Between the turbine site and the homes is one of the busiest divided highways in Massachusetts. And yet, a few residents have come close to shutting down the turbine. Among their complaints, noise. Interesting given they live one street away from a divided highway. As we are nearing a tipping point I imagine we will see ever growing efforts to discredit renewable energy. From community organizations to paid ‘trolls’ on the Internet, it is a disturbing, though not surprising reaction to the success of renewable energy. See also here about dark money fighting renewables. See Here about scientist (soon) paid to develop flak for the O&G industry. More about and climate change denial Here . New Yorker looks at the potential legal vulnerability of Exxon Mobil and how it bears similarities to the tobacco industry. This entry was posted in Fossil Fuel and tagged NIMBY, Wind Energy. Bookmark the permalink.